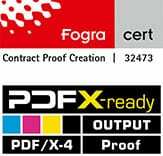 All about proofing, color management, digital proofs and more: Proofing.de – first hand information about GRACol, SWOP, G7, ISO and Fogra proofing. In order to describe colors accurately and avoid metamerism, modern color measurement is increasingly no longer carried out via colorimeter that can measure one color spot in the 3-dimensional colorspace LAB, but by spectral measurement, ie the recording of the complete emission spectrum or reflection spectrum of a color. Even with cameras, this technology is used. So images are no longer to be photographed in RGB, but with systems such as the Can:View, images can can be photographed in 16 individual spectra between 400 and 700 nm with 11 million pixels. Each of these pixels is thus defined spectrally. In retouching, one type of light can be used, D50 or D65 for example, and – since the spectrum of the illuminant is known – the image can be easily processed by the multi-spectral data with a mouse click on the required standard light for retouching. At present, with the can:view (softproof system) and the can:scan (camera system) a complete system is on the market for recording and edition images with multispectral data. Outside catalog manufacturers and fashion companies, the technology has not yet arrived in the broad market. Order Proofs online, fast worldwide shipping. Why is the embedding of RGB profiles so important? Proof of EAN / GTIN Codes for large retailers as ALDI and HOFER.